of plants – seeds, bark, leaves, stems, roots, flowers and fruits. TanTien’s essential oil blends were inspired by the evolution of tea. In our recent past, if you wanted a tea to strengthen the immune system, you would buy burdock. If you wanted a tea to improve liver and kidney function you would buy dandelion. And then you would need to understand blending so as not to injure the kidneys or liver. Now we just let the knowledgeable ones do the blending and we pop into a store and pick up a detox tea. Blends raise the vibration, the efficacy, of herbs and essential oils. Think of it like love. When you develop a loving relationship, you become more than yourself. Essential oils, like herbs or love, exponentially increase in vibration when combined. TanTien’s essential oil blends are for people who are looking for alternative ways to help themselves; for people who are taking responsibility for their health and happiness. We are discovering that we are born with the power to harmonize our bodies with the life sustaining fields of the earth. We can retune ourselves. Through color, light, sound and scent vibrations, at the deepest level, we reorganize at the cellular level. Here’s to you, a person, who chooses to live life consciously, creating space for transformation, through raising your vibration. have many utilitarian health advantages. Why? Essential oils, through their vibration, directly stimulate both the limbic lobe and the hypothalamus, which has profound effects on both the mind and body. Smelling essential oils triggers electronic impulse to the olfactory bulb; the amygdala (where emotional memories are stored); and other parts of the limbic system, activating the hypothalamus, which is one of the most important parts of the brain; controlling among other things the endocrine system. Smell relays messages directly to the brain; influencing the physical body, the mind and the emotions. For example: Researches in Berlin and Vienna found that the sesquiterpenes in sandalwood increases the level of oxygen in the brain up to 28%. Smell the essential oil blend, directly from the bottle and/or apply the blend to the palm of your hands, rub your palms together; now bring your hands to your nose and inhale deeply. Be sure to keep away from your eyes. We all know that perfumes placed on the pulse points increases the durability of the scent. 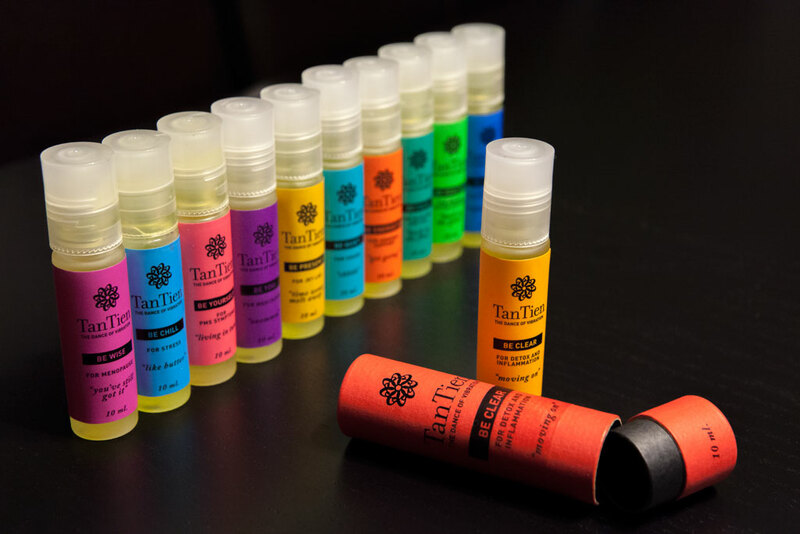 TanTien’s essential oil blends, not only smell fantastic, bonus, they have a higher purpose. To get the most out of your blends, a general rule of thumb is, use on the extremities of the body: the hands, the feet, the head, the top and bottom of the spine. Some of TanTien’s blends are for specific conditions; ie, BE CALM for gas and bloating. Use this blend directly on the tummy, for quick results. The BE YOGI blend for meditation can be used on the 3rd eye, in the middle of the forehead. BE QUIET works well on the throat and chest area though you might want to try it on the bottom of your feet at night. Copyright © Tan Tien LLC. All Rights Reserved.